The listing suggests the date of the first build as being in the 15th century which would place the original house in the Medieval period. The front certainly looks to be an added 18th century one. Assuming the 15th century date to be correct, one would expect to find a hipped roof see photograph above with flatways rafters and/or flat joists plus jowled posts. Although the reported earliest known date of 1527 is in the Tudor period, there is no reason why the house should not be earlier. The house is said to be named after the unfortunate John Fisher, Bishop of Rochester, supposed to be the father confessor of Lady Margaret Beaufort, mother of Henry VII who installed her at Woking Palace, made a cardinal in 1535 and executed by Henry VIII the same year. The earliest reference to the house is found in the Court Rolls of Woking Manor 1 – 3 Edward VI Richard Byg, gentleman “holds by copy (1527) …one customary tenement called Fishers otherwise Runtley late of ……. John Byg (his father). An article in the Woking News and Mail of 28th May 1954 states …the land was given by Lady Margaret Beaufort (mother of Henry VII and founder of Lady Margaret Hall, Oxford) to her cellar man, one Simon Fisher, in 1540. This cannot be so since Lady Margaret Beaufort died in 1509. In any event the land was copyhold and part of the Royal Manor of Woking. The land would have belonged to Lady Margaret insofar as she was the Lord of the Manor. Richard Waterer was the holder of Runtley Lands in 1604 according to a survey carried out of Woking Manor in the second year of James I’s reign. When Woking Palace was abandoned by Sir Edward Zouch in the 1620’s, it is likely that some of the fittings were reused to improve other fine houses in the district. According to Annals of an Old Manor House by Frederick Harrison, some of the fine glass at Sutton Place was probably taken from the Palace. It is possible too that the gallery presented by Sir Edward to St Peter’s church also came from the Palace. It is, therefore, reasonable to suggest that the Fine Jacobean style staircase in Fishers Farm may well have originated from the same source. It is unlikely that local carpenters would have been employed to build such a fine staircase. It is more likely that the staircase would have been imported most probably from another house of quality. The third Lionel Rawlins appears in the Free and Voluntary Present to Charles II 1661-2 when he gave £5 and the fourth in the List of Tenants of the Manor 1691-3 where he is described as gentleman in 1691 and 1693 and in the Association Rolls 1695. Fishers Farm can be located as item 197 in the old tything of Hale End on the map see left and its accompanying commentary. The farm is represented by a miniature house. The River Wey can just be made out to the right of the map and it can be seen that the house is on the boundary of the Manor adjacent to Emilies Manour. The copyholder is John Rawlins who is listed as the copyholder of items 186 to 200 ie not including items 201-3 which extend to the present day Runtley Farm House, probably not built then. John Rawlins was probably he who is buried in St Peter’s churchyard. Remnant describes the house as a cottage a term which he applies to numerous other substantial houses, for example, the Old Brew House in the village. There is no mention of the Fishers Farm in the 1851, 1881 and 1891 Censuses. It is likely that the house was then known as Tices Farm after Benjamin Tice who acquired the copyhold from William Smyth of Goldalming in 1820 subsequently selling the farm to James Garment in 1825. It is worth noting, considering the Rawlins family’s association with the farm, that a John Tice married Elizabeth Rawlins in 1705 and Catherine Tice probably the daughter of John Rawlins and her husband William are buried in John Rawlins’s listed tomb in St Peter’s churchyard. The court rolls of the Manor of Woking record the admission on 8th July 1755 of John Tice only son and heir of Elizabeth Tice to the copyhold lands held by her brother Lionel Rawlings including the messuage called Runtley alias Fishers. Arthur Locke says in his A Short History of Woking Mr Woodhatch was the tenant in the 1830s. The Apportionment shows John Garment as the Owner with William Woodhatch as the Occupier. They are also the Owner and Occupier of neighbouring Moor Lane Farm and the fields between the two farmhouses The Court Rolls in 1853 note the death of John Garment the then copyholder of Runtley otherwise Fishers. During the 19th century it appears there were often more farm houses than were necessary to farm the land in the area. 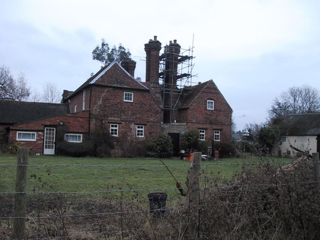 As a result, separate farm holdings were operated as one and the redundant farm house used to house labourers and others working on the farms. Tices Farm (Fishers) is such an example being worked together with Moor Lane Farm.